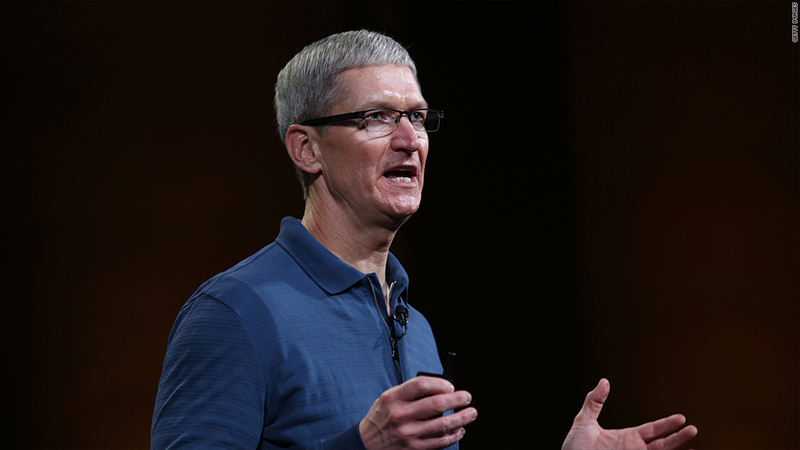 Apple CEO TIm Cook will sit with the First Lady in special box seats at the State of the Union address on Tuesday. Apple CEO Tim Cook has made it onto a very short list: He'll be a guest of First Lady Michelle Obama at the State of the Union on Tuesday. The First Lady has a history of inviting tech leaders to the annual event. Last year's special guests included Laurene Powell Jobs, widow of late Apple (AAPL) co-founder Steve Jobs, and Instagram co-founder Mike Krieger. Instagram sold itself to Facebook (FB) two months later. Tuesday will be a busy day for Cook. At 10:15 a.m ET, he will speak at Goldman Sachs' Technology and Internet Conference in San Francisco, where he's likely to face tough questions. Apple shares have lost nearly a third of their value over the past five months. Cook will also likely address activist investor David Einhorn at the conference, who publicly called for Apple to give some of its $137 billion cash hoard to back to shareholders in the form of preferred stock. Apple surprised industry watchers by replying with a statement, saying the company "will thoroughly evaluate" Einhorn's proposal. - CNN's Gregory Wallace contributed to this report.